Advantages: Excellent pictures, some in color, and profiles and English text. Conclusion: This one is a definite must have for the Luftwaffe enthusiast. My first impression, after thumbing through this monograph when I received it, was “like the Luftwaffe in Focus (LiF) series and kicked up a notch”. But, this new monograph on the Luftwaffe takes a quite different approach. In design, it is in landscape format, like the Squadron “In Action” format, rather than typical magazine A4. 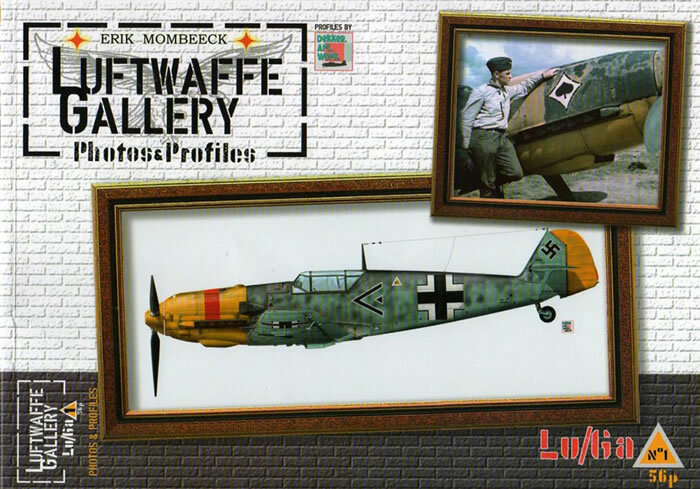 Unlike the LiF, Luftwaffe Gallery (also known as Lu/Ga) focuses on color and markings, rather than specific aircraft. It is this focus that immediately gets one’s attention, and holds it. The large and well done profiles by Thierry Dekker certainly catch one’s attention. The profiles are directly related to the numerous photographs, some of which are in color; good planning. But one realizes that there are also words. Yes, there is text, although ones’ eyes are often diverted back to the pictures and profiles. While the text does provide good captions to the photos and profiles, the text is also the weak point of this monograph. Simply said, the text could provide a bit more background and explanatory information on some of the subjects presented. I will note this in my overview of the various articles. Article 1 in the Markings Gallery deals with removal of JG 53’s ‘Pik As’ emblem and the application of a red fuselage band to the unit’s aircraft during summer and fall of 1940. There is a small explanation of the various theories that have evolved as to why the ‘Pik As’ was replaced by the red band. There are some good pictures that go beyond the subject. For example, on page 6 there is a picture of an aircraft that wears a most interesting camouflage that appears field applied (I do not believe it is the same aircraft that appears on the bottom of page 7, as is noted.). Article 2 is concerned with “Yellow Cowling on Bf 109Fs”. Here is where some explanatory text could be very helpful. The article covers yellow cowlings on Bf109Fs in the Battle of Britain and on the Eastern Front. Without background, one could wrongly conclude that the yellow cowling was particular to the 109Fs, rather than specifically designated recognition markings. The basis for the use of this marking in the BoB and on the Eastern Front would be helpful. Then there were the yellow cowlings of aircraft in the Balkans. Next is Article 3 on “White Noses on Bf 110s”. Again, a little more explanation of the white nose would have been helpful. While the article seems to imply that it was a ZG 26 marking applied in the BoB, aircraft of LG 2 and ZG 76 are also included without further explanation. I also have an issue with the profiles in this section. Yes, I know about B&W photo interpretation, but as most all the aircraft appear to be C models, the profiles appear, to me at least, to portray them in 74/76/76, which I believe came in later in the Bf110 E production. Article four comes under the heading of Colour Gallery. This article is a collection of colour photographs of Ju 88s. The primary profile is of a Ju 88A-5 in black distemper for night operations in Libya. The gallery changes for Article 5, which is the “Camouflage Gallery”. The article focuses on the “cross hatch” style of fuselage camouflage that was applied to various fighters during the BoB. The primary focus is on the aircraft of JG 52, but aircraft of JG 54 and Erp. Gr. 210 are also shown. I have always wondered about the “planning” behind the use of this pattern. It does not seem arbitrary in its application as a number of units used it, and I have seen it on the leading edge of Fw 190A-3s of JG 26. The gallery changes to the “Equipment Gallery” with Article 6. The information, photographs and profiles contained in this article are quite new to me as the article is about the lapel badges worn by members of the various Luftwaffe units. They were miniatures of the unit badges applied to the aircraft. Wonder if they traded pins like the athletes at the Olympics? The monograph concludes with Article 7 in the “Emblem Gallery”. Here we find out about the “Bonzo dog” of 1./JG 2. Even though the dog was the creation of a British illustrator, and allegedly resembled Churchill, it was adopted to show…. (You have to read the monograph for the answer.). Clearly, this is the first of many future Lu/Ga monographs. The various subjects that will appear in Lu/Ga No. 2 are already set out on the last page. This is an auspicious beginning to what, hopefully, will be a great source of reference material and modeling inspiration, if not debate about colors and markings. As I have noted, it is not without its faults. But I see these as easily resolvable in future issues. It should be noted that the monograph is printed on high quality, heavy weight paper, with excellent image reproduction. While it is a paperback, the covers are heavy weight with a nice glossy finish. A well made publication. Sample pages may be seen by clicking on this link. Thanks to Erik Mombeek to for the review sample.